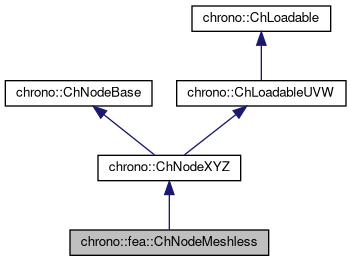 Class for a single node in the meshless FEA cluster. Reference (initial) position of the node - in absolute csys. Get the kernel radius (max. radius while checking surrounding particles). Set the kernel radius (max. radius while checking surrounding particles). Get collision radius (for colliding with bodies, boundaries, etc.). Set the mass of the node. Get the mass of the node. Access the variables of the node. Get the number of DOFs affected by this object (position part). Get the number of DOFs affected by this object (speed part). Get all the DOFs packed in a single vector (position part). Get all the DOFs packed in a single vector (speed part). The force and its application point are specified in the gloabl frame. Each object must set the entries in Q corresponding to its variables, starting at the specified offset. If needed, the object states must be extracted from the provided state position. Easy in this case because there are no roations.. Note that the simulation algorithm might reset this once in a while, exp. for highly plastic objects.